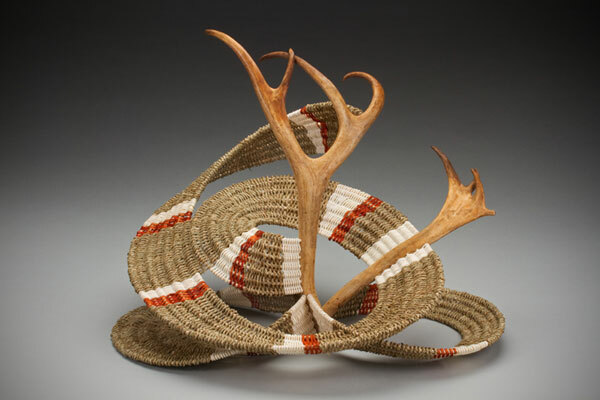 Reindeer antler with seagrass, reed and dyed cedar bark. 20” x 30”high. 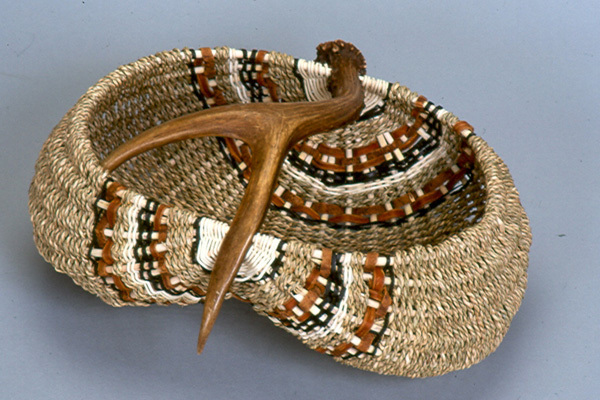 Whitetail deer antler with seagrass, reed and cedar bark. 13” wide x 7” deep x 12” high. 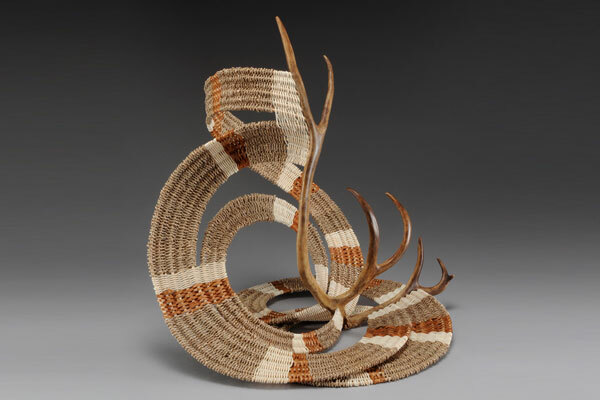 Mule deer antler with seagrass, reed and dyed cedar bark. 24” wide x 10” deep x 25” high. 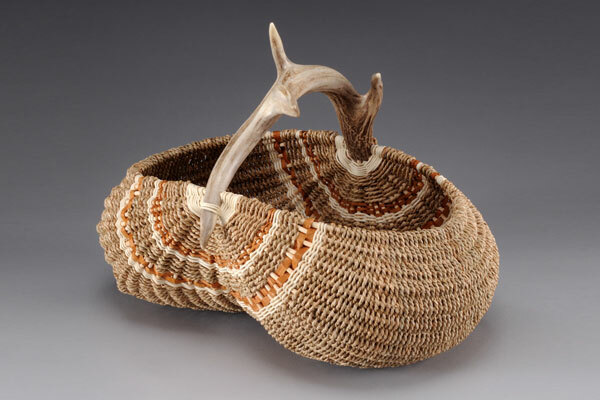 Elk antler with seagrass, reed and dyed cherry bark. 39” wide x 13” deep x 18” high. 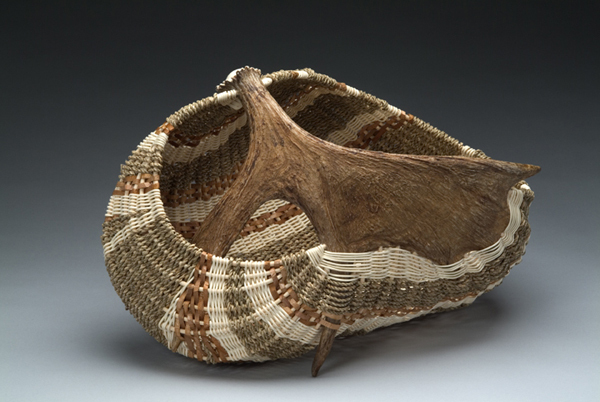 Caribou antler with seagrass, reed and cedar bark. 45” wide x 20” deep x 32” high. 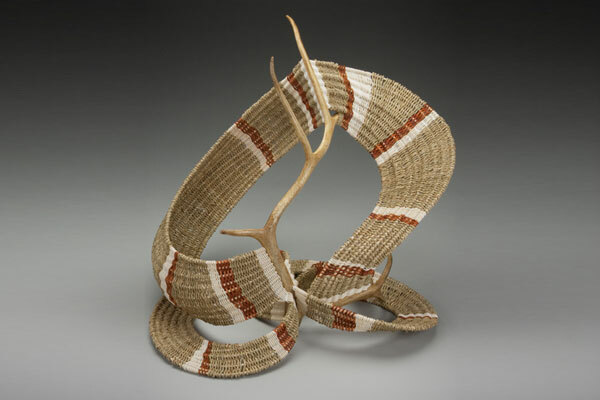 Reindeer antler with seagrass, reed and dyed cedar bark. 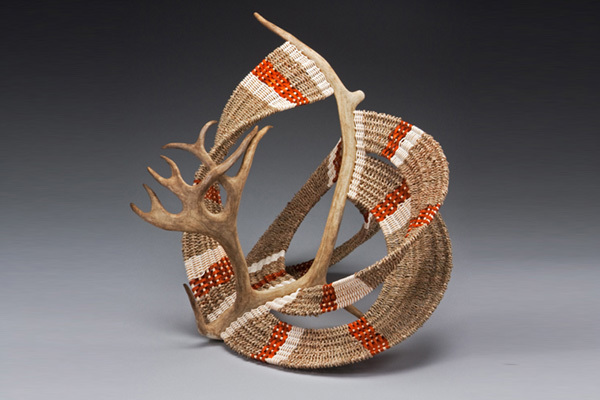 24"x 20"
Reindeer antler with seagrass, reed and dyed cedar bark. 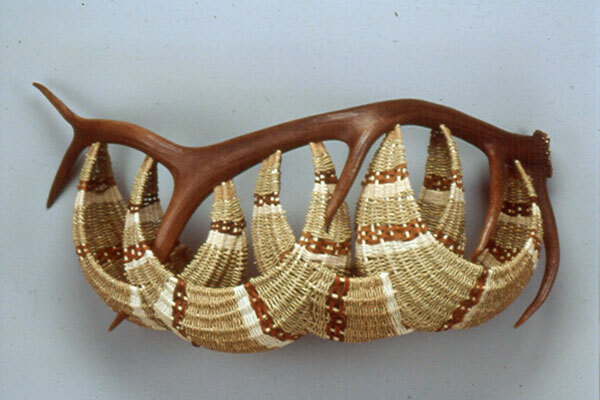 20"x26"
Moose antler with seagrass, reed and cedar bark. 30” wide x 18” deep x 18” high. 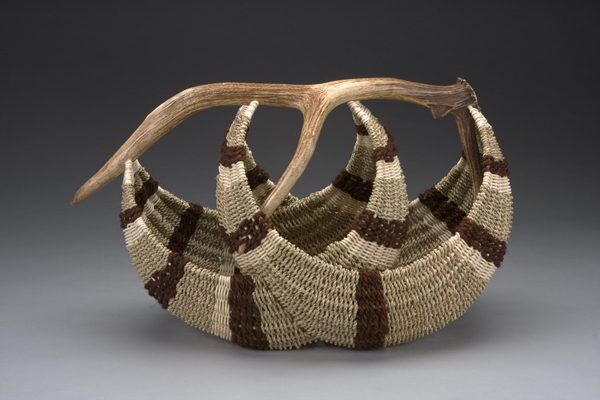 Reindeer antler with seagrass, reed and dyed cedar bark. 24” wide x 24” deep x 32” high. 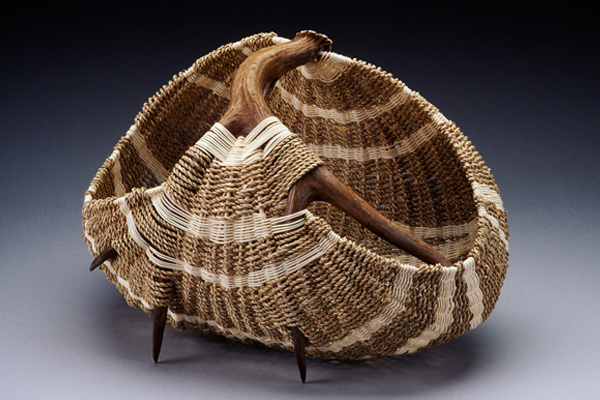 Elk antler with reed, seagrass, dyed coir. 30” wide x 14” deep x 22” high. Deer antler w/ seagrass, reed, dyed cedar bark, tanned deer hide, deer fur & green opal stones. 28” wide x 28” deep x 34” high. Deer antler with seagrass, reed, cedar bark and dyed cedar bark. 9” wide x 6” deep x 5” high. Deer antler with seagrass and reed. 20” wide x 15” deep x 18” high. 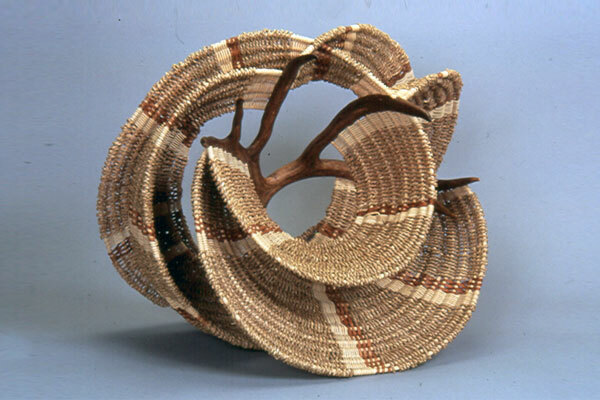 My baskets are woven in Oregon’s Willamette Valley and the main focus of my art is using naturally shed antlers from deer, elk, moose, caribou and reindeer. The males of these species all shed their antlers in the winter and grow a new set each spring. 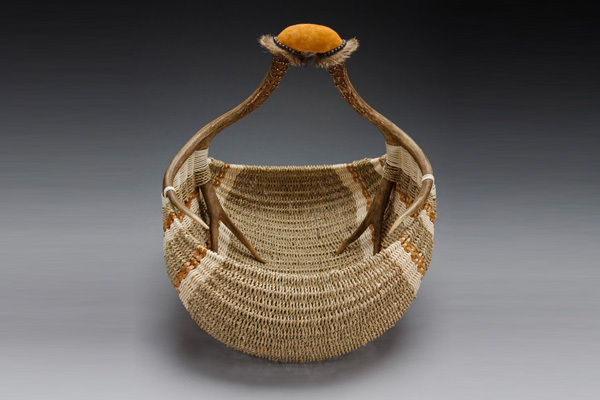 My weaving techniques combine traditional Appalachian styles with contemporary methods. 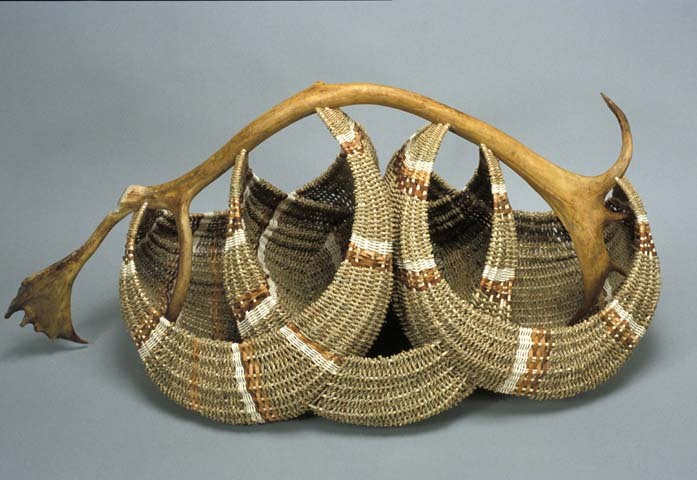 Natural materials including cedar and wild cherry bark, reeds and grasses are woven with the antlers to create unique baskets that reflect the natural grace of the antler. Cedar bark is gathered using traditional techniques from trees that are due to be harvested. The bark is pulled from the trees in long strips and the inner and outer bark are then separated. Only the inner or cambium layer of the bark is used in the basket, the outer bark is left in the woods.